The succession of flowering shrubs through the seasons is a large part of the beauty of a garden, bringing interest to every part of the year. Yet in many gardens the shrubs are overgrown, and often flower poorly because of incorrect pruning. A little understanding can go a long way to help that, and it is not difficult. Like many things, once we grasp the basics, we learn fast, and are soon able to bring out the best in the plants we grow. Let’s look at each of these ideas in turn. Plants have a structure designed for growth. Tucked into the place where each leaf meets the stem is a cluster of cells that can produce new growth – a bud. Towards the ends of branches the buds are often more obvious, but even further down the stem they are there, in a dormant, unformed state. The length of stem between two leaves or buds will never produce new growth. Instead it will simply die back to the first bud, leaving an ugly dead twig, that can also decay and spread disease down into the healthy tissues. When pruning, make the cut just above the bud. To avoid damaging it, or leaving it easily broken, slope the cut up to the bud, not down from it. Some plants have their buds and leaves in pairs, so there, just make a horizontal cut. Speaking of cutting, it pays to invest a little in a good pair of pruners, or as gardeners say, secateurs. Choose a pair where one sharp blade passes in a scissor action past a thicker blade that holds the stem. Learn to turn the pruners around so the thick blade always touches the part of the stem you will throw away, to avoid bruising. Good secateurs have replaceable blades, as this is easier than sharpening them regularly – they should always make a clean cut. Almost all plants that flower in the early months of the growing season have formed the buds for those flowers during the year before. You can often see them when leaves have fallen. The flower buds come out along the stems from the year before, although some plants, like flowering cherries, or crab-apples, develop ‘spurs’, which are short side stems that flowers over many years. Bush roses flower on new wood, and most climbing roses on old, so prune accordingly. If, in the rush of spring-fever, you head into the garden, and trim everything in sight, you will remove most of the flowers from these plants, and have a disappointing spring. Instead, wait until flowering is over, and then prune. Beside each flower cluster there is also usually a leaf bud, so shorten back, or remove completely, the stems that have just flowered. This will encourage lots of new stems to grow, and these will flower next year. Other plants, in contrast, make their blooms at the ends of new growth produced during the current season. Hydrangeas are a classic example. With these plants, we want to encourage them to make sturdy new shoots in spring, that will grow and bloom later. This means that in spring, before the new growth comes, we cut the plant back to a framework of older stems, keeping the plant more compact. Cut each stem that grew the previous year back to just an inch or two long, or remove older stems and leave new ones, taking off the tip only. This is also the time to think about the overall shape of the plant, how tall you want it, and so on, so some new stems may be left longer, to build that structure or replace old stems you are removing. As woody plants age, the stems become thick, and often fewer flowers are produced from them. To keep plants permanently in more youthful vigor, these older stems need to be removed. The standard rule is to take out one-third each year, but that can be a bit drastic, and a fifth or a quarter is probably better. Often old stems can suddenly produce strong new shoots lower down, and the ideal thing is to cut them back to that shoot, and then allow it to grow up and replace the old one. Removing old stems at or close to the ground will stimulate the plant to replace them with vigorous new ones from lower down. If you do this regularly, you will keep your plants vigorous for many years, and stop them becoming overgrown and unattractive. With some late-flowering plants, you can create more flowers by plucking out the tip of the new shoots as they grow early in the season, keeping the plant bushier and tripling the number of flowers. Gardeners call this ‘pinching out’. Just remove the soft growth at the end of the stem, before it expands fully. Not all plants respond to this method – Fuchsia will, but Hydrangea won’t, so check before you pinch. This kind of light summer trimming can do the same for some spring flowers too, but doing this needs a bit of research or experimentation before going around your garden and doing it to everything. These few simple guide-lines are really all that you need to prune 90% of the shrubs and flowering trees in your garden. A few, often slower-growing ones, may need little or no regular pruning, but most will benefit from an annual work-over. You will keep your garden full of flowers, on attractive, vigorous shrubs that will look almost as good when they are not flowering, as they do when they are. No, they are tough. 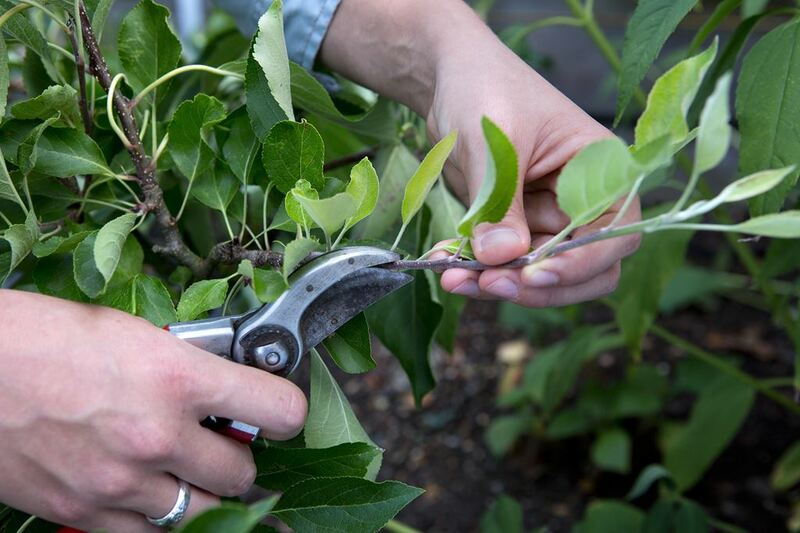 Better to prune in early spring, before budding out, though, if you can – it’s a lot easier to see what you are doing! Some people trim burning bush like a hedge several times a year – you won’t hurt it.